What Day Of The Week Is November 16? 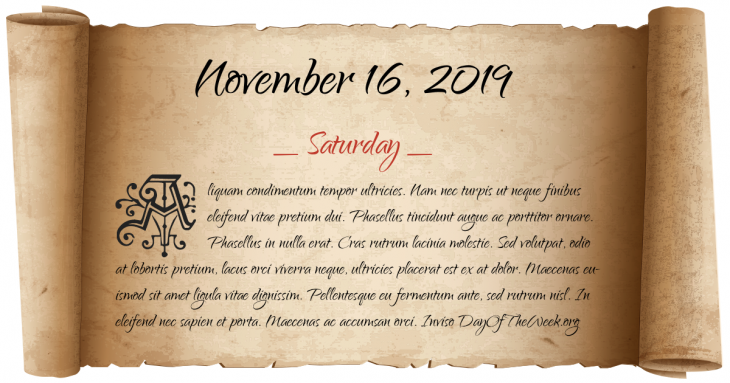 November 16, 2019 is the 320th day of the year 2019 in the Gregorian calendar. There are 45 days remaining until the end of the year. The day of the week is Saturday. A second and final revision of the Codex Justinianus is published. While travelling during the Ninth Crusade, Prince Edward becomes King of England upon Henry III of England’s death, but he will not return to England for nearly two years to assume the throne. Francisco Pizarro and his men capture Inca Emperor Atahualpa. American Civil War: Battle of Campbell’s Station near Knoxville, Tennessee – Confederate troops unsuccessfully attack Union forces. LSD is first synthesized by Swiss chemist Dr. Albert Hofmann at the Sandoz Laboratories in Basel, Switzerland. Dueren, Germany is destroyed by Allied bombers. Bill Clinton becomes the first U.S. President to visit Vietnam since the end of the Vietnam War. Who were born on November 16?